We are a family-owned pest control business servicing Colorado Springs, El Paso County, Pueblo West and Pueblo, Colorado. Our team specializes in Integrated Pest Management Services. That means we treat for all pest and rodents using chemicals and other methods such as sanitation, exclusions and also harborage removal. Common pest and rodents in the Southern Colorado region include spiders, bed bugs, mice, bees, wasp, ants, voles, scorpions, centipedes, and many other invaders. We take our time to identify any pests that we find and treat accordingly. Why-U-Buggin’ cares about your animals in addition to your family and use only safe, efficient products. We offer professional pest management services for all homes and businesses in the Colorado Springs and Pueblo area. So give us a call for a pest inspection, whether you have a pest control issue or rodent control issue we will send a qualified technician at your convenience, identify the pest or rodent and offer a solution to the problem. Our company will continue to strive to become the premier choice for pests related services. Honesty and Integrity are the two traits you’ll find with Why-U-Buggin Pest Control. It is our goal to offer the best affordable service backed by the most generous guarantee in the industry. Let us know how we can serve you. Our method of removing unwanted pest and, rodents are safe, efficient and environmentally friendly. 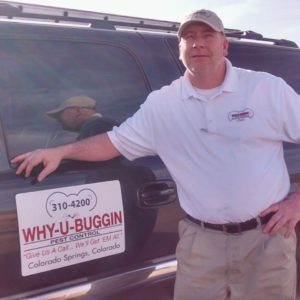 Why-U-Buggin’s owner, Hank Spivey, has over 23 years experience and is committed to providing our customers with a higher standard of pest control. Our owner also lives in Colorado Springs and has lived here for over 10 years. He previously lived in Florida where he was born and raised. Hank started his career over 26 years ago, soon after leaving from the Army, and he loves his job. He has been married to his wife for 30 years, and they have three beautiful children.